Description: This is a white cassette tape recorder with a red tape face, multi-colored buttons across top (red Stop/Eject, green Play, yellow Forward and Reverse and blue Record). There is a red volume control knob on the front beside the tape face, and a red hand-held microphone on the side to sing along or record. The microphone has a round blue speaker area and a yellow button in the center of the handle. The microphone is attached via yellow cord. Requires four C-size batteries (not included). Designed for children ages 3 years and older. The model number for this set was changed to #73800 in 1996. 1993-1995 - FPT11311 - Sold in a 11-3/8" long, 11-1/8" high, 3-7/8" deep window box marked #3800. 1996 - FPT12231 - Sold in a 11-3/8" long, 11-1/8" high, 3-7/8" deep window box marked #73800. 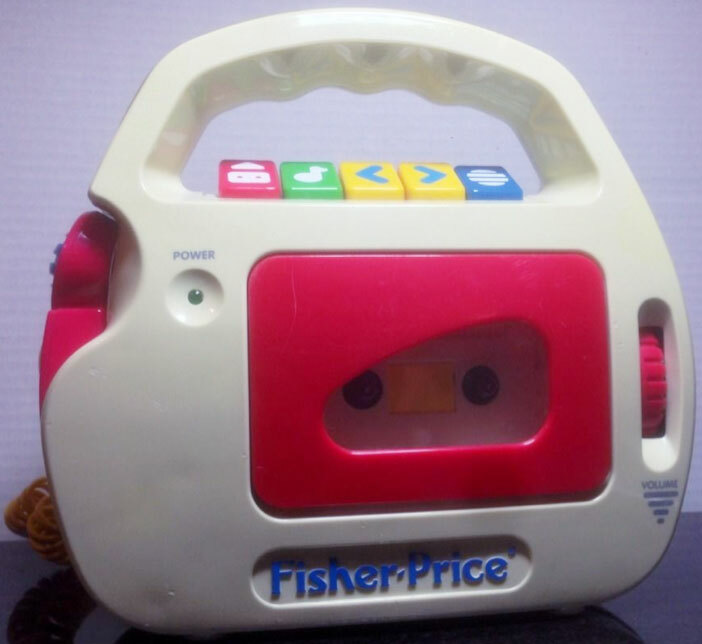 Also see 1981-1987's #826 Fisher-Price Tape Recorder. 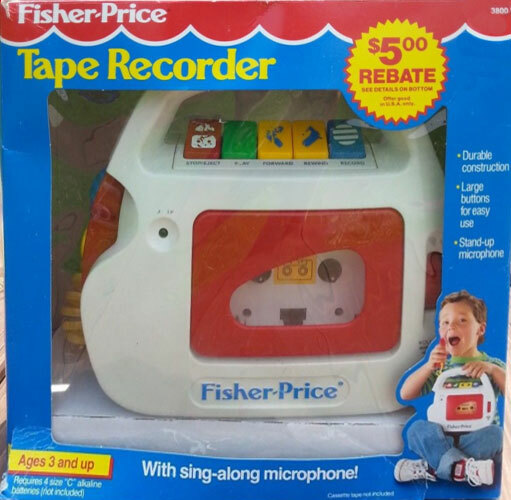 Also see 1988's #3808 Fisher-Price Tape Recorder. Also see 1989-1991's #2209 Tape Recorder. This tape recorder replaced 1991-1992's #3818 Tape Recorder. This tape recorder was replaced in 1997 with #73801 Kid Tough Tape Recorder. Replacement needles and other maintenance/repair items for this phonograph are available at This Old Toy's Toy Store.